Exploring musical destinations across the country. I had been planning my trip to The Crooked Road for almost two years. It was an eye-opening musical adventure that didn’t last nearly long enough. You would be hard pressed to see half the Crooked Road venues in a week, we did our best to fit all the major venues into four days and five nights. On Thursday evening I drove down as far as Harrisburg, Pennsylvania. Friday morning Denton, Texas, musician David White flew into Harrisburg and our adventure began with a seven-plus hour drive. 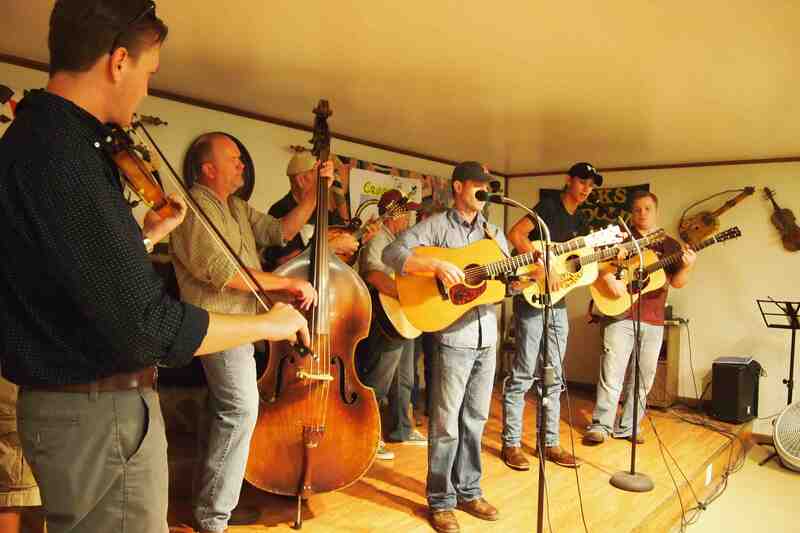 Our first stop was Allen Hick’s Friday Night Jam in Nickelsville, Virginia, which is toward the western end of the Crooked Road. The jam, actually jams, were already in full swing when we arrived on a long, winding mountain road. The main stage at Allen Hicks jam. 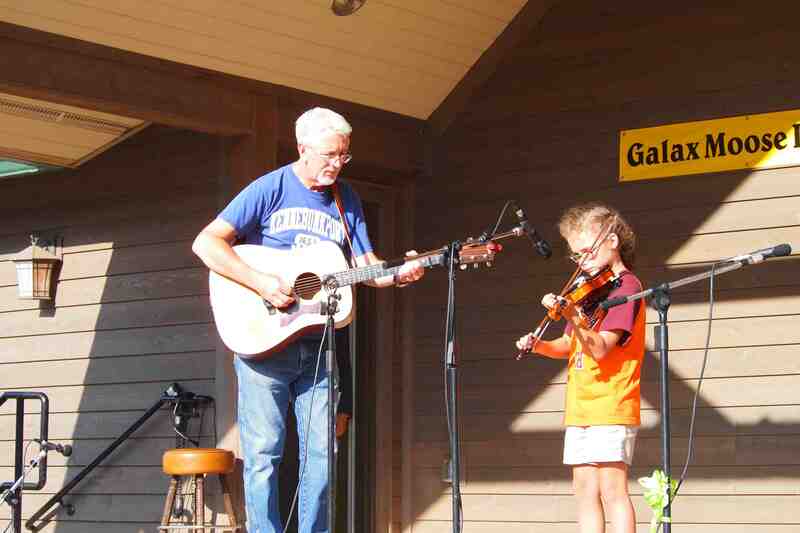 There must have been 100 people of all ages gathered for an evening of old-time and bluegrass music. Allen Hicks converted a barn into a venue with an open-air bottom main floor stage and church pews. On stage were about eight musicians playing all of the traditional old-time instruments. 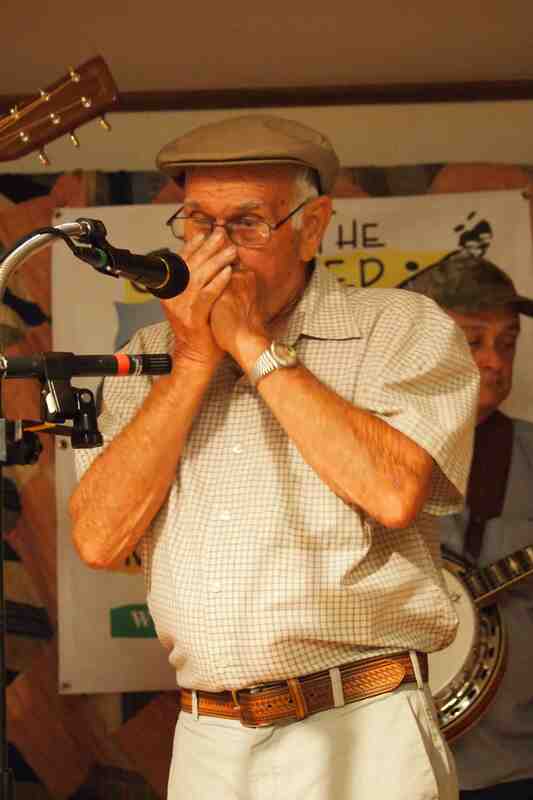 Allen welcomed us and later took to the stage on harmonica. Later, we ventured upstairs where another jam was happening outside on the front porch. Just inside the front door, a kitchen was serving up hotdogs, anyway you like them, along with a variety of other snacks. 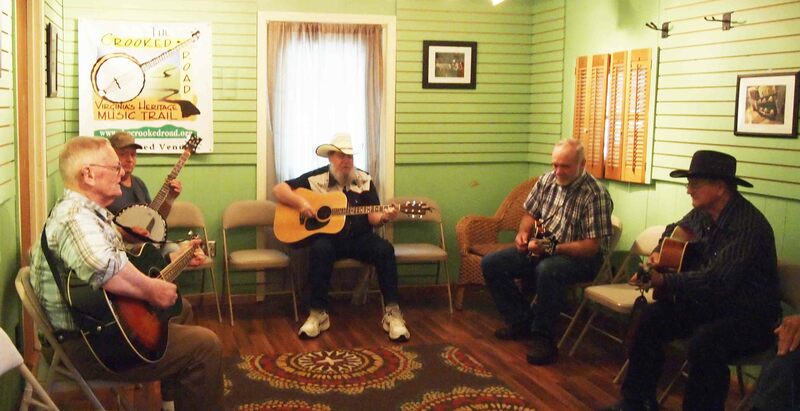 We discovered a third jam session crammed into a back room before we were led to Allen’s workshop where he builds mandolins, a “hobby” he took up following retirement. Allen Hicks joins the jam on harmonica. More musicians gathered on the porch at Allen Hicks Jam. We were awed by the talent at Allen Hicks Jam. The musicians were welcoming and very warm. It was the perfect introduction to The Crooked Road and the sights and experiences that awaited us over the next four days. Exhausted from our drive and the excitement of the experience at Allen’s, we retired to The Ole Nickelsville Hotel. The cozy century-old hotel was the perfect spot to rest up for the following day’s adventures. The next morning we were up bright and early and on our way to the Ralph Stanley Museum and Traditional Mountain Music Center in Clintwood, Virginia, near Stanley’s hometown of McClure. Museum Director Tammy Hill greeted us and explained how the historic building became a museum. She says the museum is personal to her and other locals as the family is part of the community. She went to school with Ralph’s daughter. 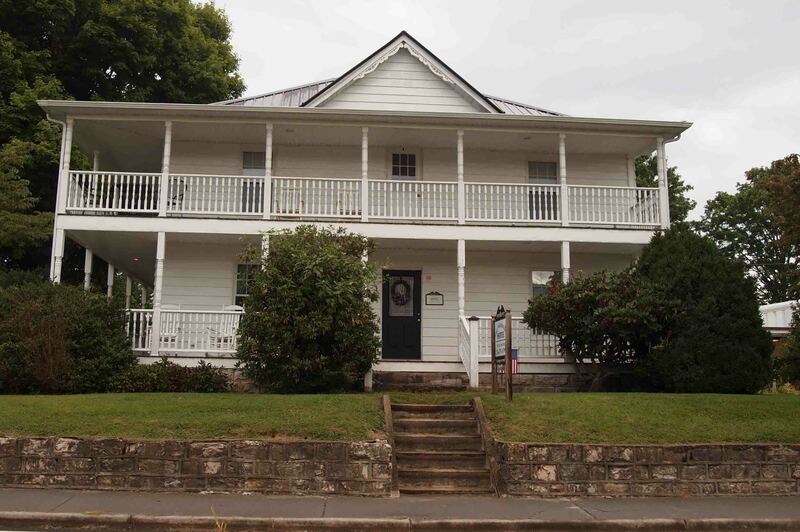 The first two floors of the home tell the fascinating story of how Ralph Stanley and his brother Carter got started in music. 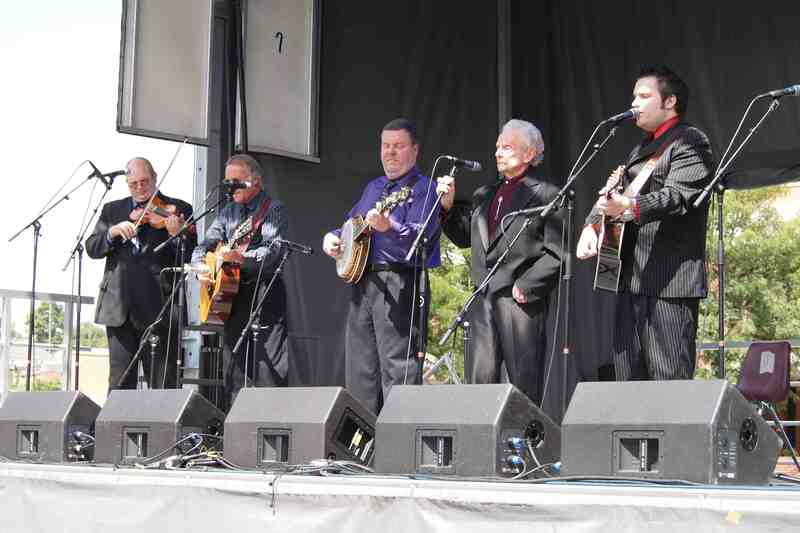 An audiophone tour is narrated by Ralph Stanley, himself. The top floor of the home is lodging for visitors to Clintwood. We could have probably spent half a day in this fascinating museum, but we had an itinerary to follow. One of the interactive exhibits in the brand new Birthplace of Country Music museum. Soon we were on the road, driving two hours to arrive in Bristol, Virginia-Tennessee. We arrived just in time for the ribbon cutting on the brand new Birthplace of Country Music Museum. 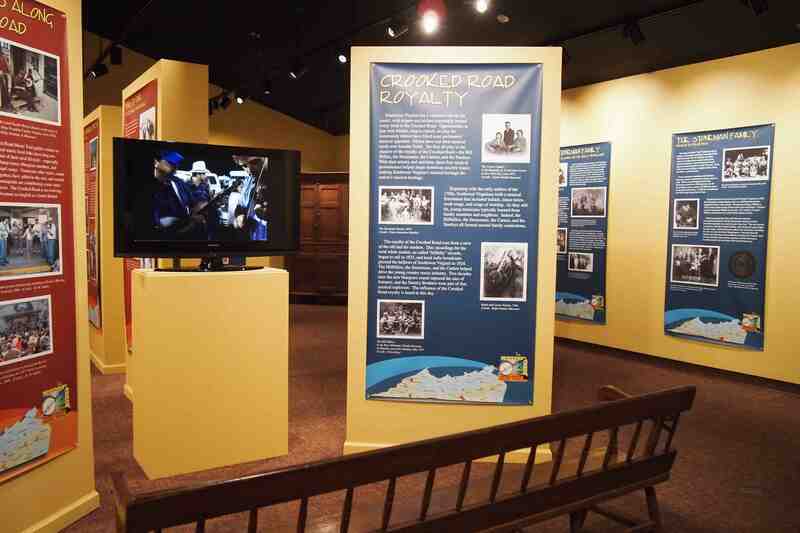 Through videos, interactive displays, and fascinating multimedia exhibits, this state-of-the-art facility tells the story behind the famed 1927 Bristol recording sessions, often referred to as the “big bang” of country music recording for the impact the pinnacle recordings had on subsequent music. Ralph Stanley and the Clinch Mountain Boys at Birthplace of Country Music Museum grand opening. Outside the museum a celebration took place with an inspiring performance by none other than Ralph Stanley and the Clinch Mountain Boys. 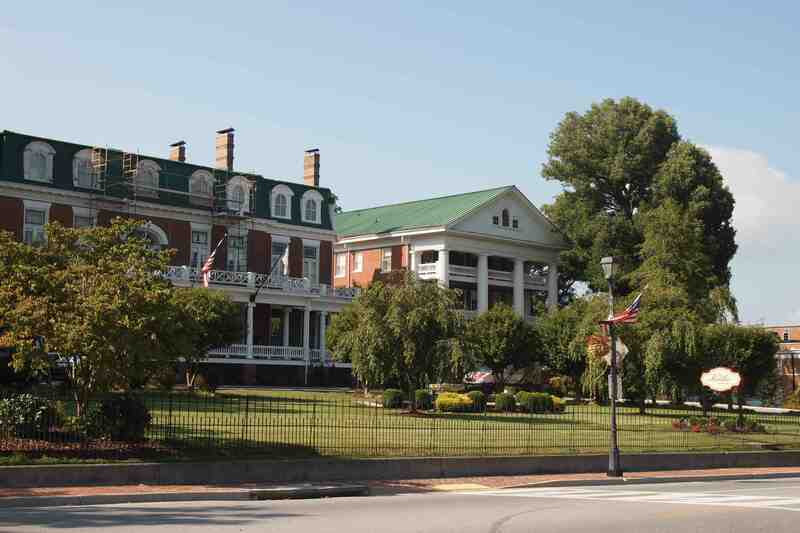 After the performance finished, we headed out for a half-hour drive to Abingdon, Virginia, where we checked into the beautiful Martha Washington Inn. We were greeted with warm hospitality and much needed bottled water! 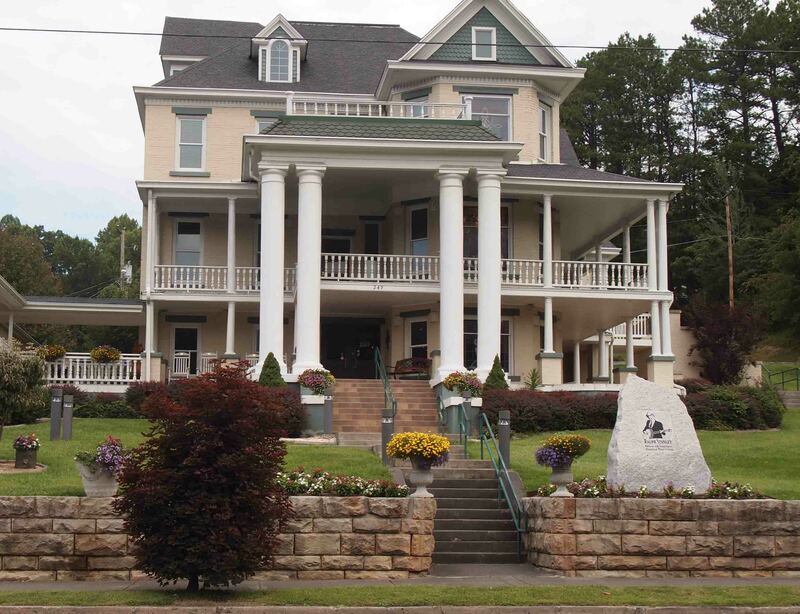 The historic hotel was built in 1832 as a private residence for General Francis and Sarah Buchanan Preston and their nine children. It served as the Martha Washington College and a Civil War barracks before becoming a hotel in 1935. On our way out of town we stopped at nearby Capo’s Music Store for their Saturday evening jam. Gill Braswell, who owns the store with his wife, Amy, explained his mission to enrich the lives of the community through music and the arts. Saturday night jam at Capo’s Music Store. 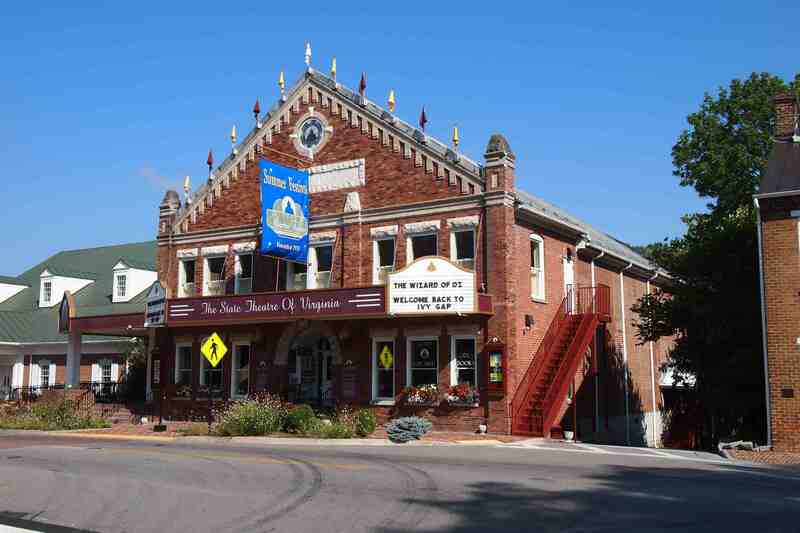 Gill and Amy are also active in Abingdon’s Barter Theatre—the longest-running nonprofit equity theater in the country. The theater, which opened during the Great Depression, accepted donations of produce from patrons for admittance to a show. Today it presents a wide variety of theatrical and musical performances. Leaving Abingdon for the evening, we drove to the Carter Family Fold, in Hiltons, which was celebrating its 40th Annual Festival. This venue, including A.P.’s former grocery store, which is now a museum, was a real step back in time. What was formerly A.P. Carter’s grocery store is now a museum to the Carter Family. 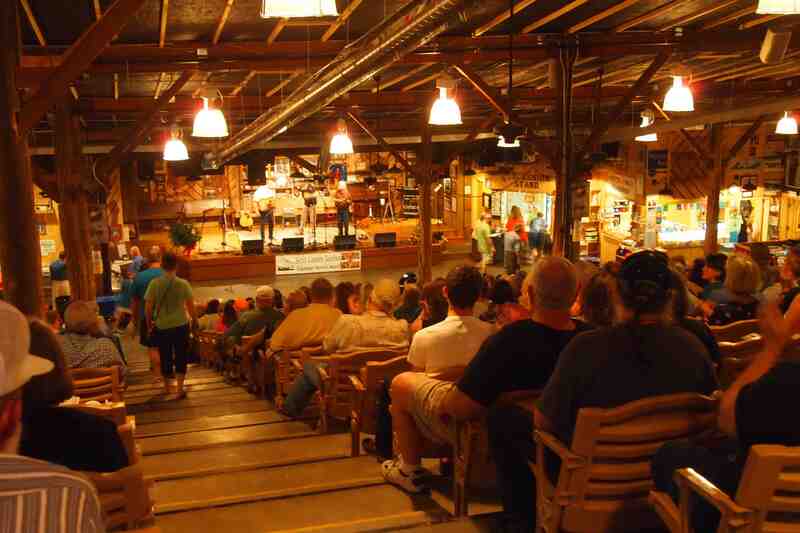 Every Saturday night there’s a show featuring acoustic bluegrass and old-time music and clogging dancers. A.P.’s daughter, Janette Carter, launched the venue to keep a promise she made to her father to ensure the Carter family’s music was never forgotten. Janette first began presenting shows in 1974 in the grocery store her father had run before he passed away in 1960. Later, she moved to a larger venue set next to the former store. There’s a musical celebration every Saturday night at the Carter Family Fold. After driving back to the Martha Washington Inn we enjoyed a complimentary evening glass of port and settled in for a relaxing night. Sunday morning Abingdon Director of Tourism Kevin Costello accompanied us to Heartwood, “Virginia’s Artisan Gateway.” He explained how Heartwood is often a first stop for Crooked Road travelers as it provides a great overview for the region, including a state-of-the-art interactive map. Heartwood is also the epicenter of the local arts community. Inside are unique products, including instruments, made by for local artisans. Video presentations let you “meet” the artists. 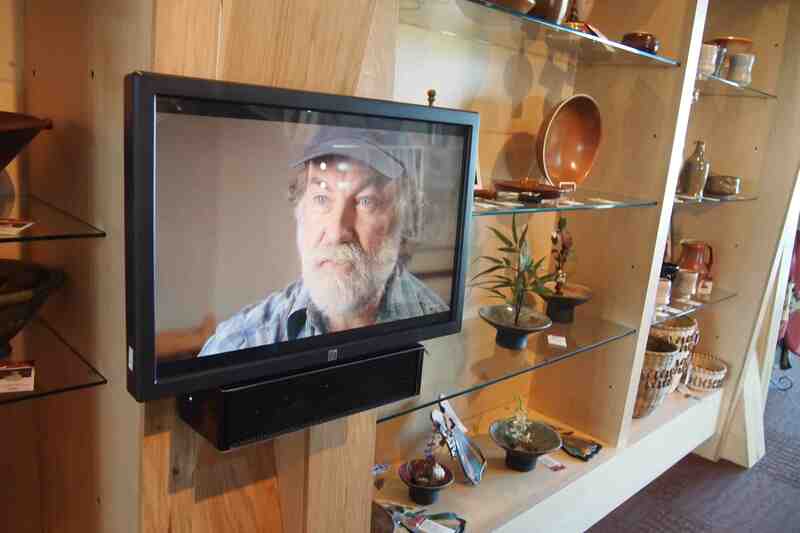 At Heartwood you can “meet” the artists through recorded video presentations. 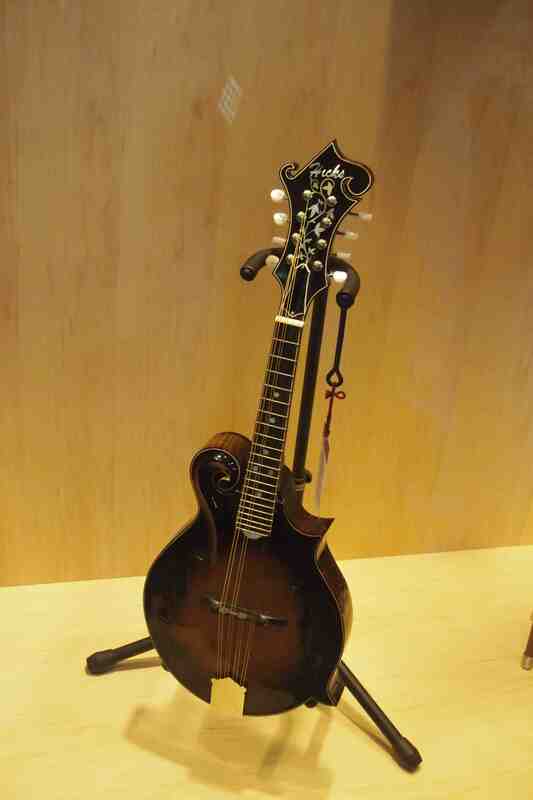 One of Allen Hicks’ mandolins is on display at Heartwood. Open seven days a week, Heartwood has a terrific restaurant and stage that presents live music every Thursday, and every Sunday there’s a Gospel music brunch. It was particularly difficult to leave Heartwood as there was a showcase of local artisans giving demonstrations on the front lawn. If you like arts and food, this is a place you won’t want to miss. 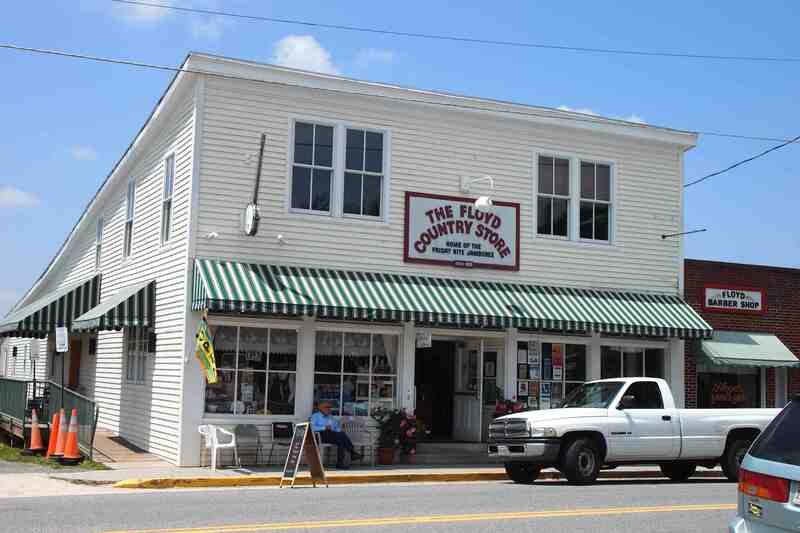 A two-hour dive brought us to the Floyd Country Store in Floyd, Virginia. Actually, Friday night is the night to visit Floyd. That’s when the whole town of Floyd comes alive for the Friday night jam with mini-jams happening all along the street. We we were unable to fit a Friday night visit into our schedule. Sunday’s was also pretty cool though. The Floyd Country Store is a real slice of Americana, a country store with old-time charm and plenty of jamming and dancing in the back. 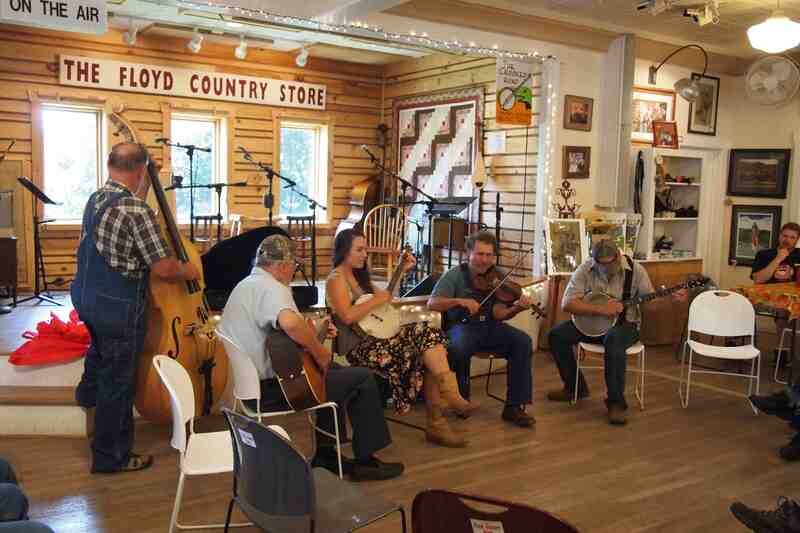 A Sunday jam session at Floyd Country Store. A one-hour drive brought us to Galax. 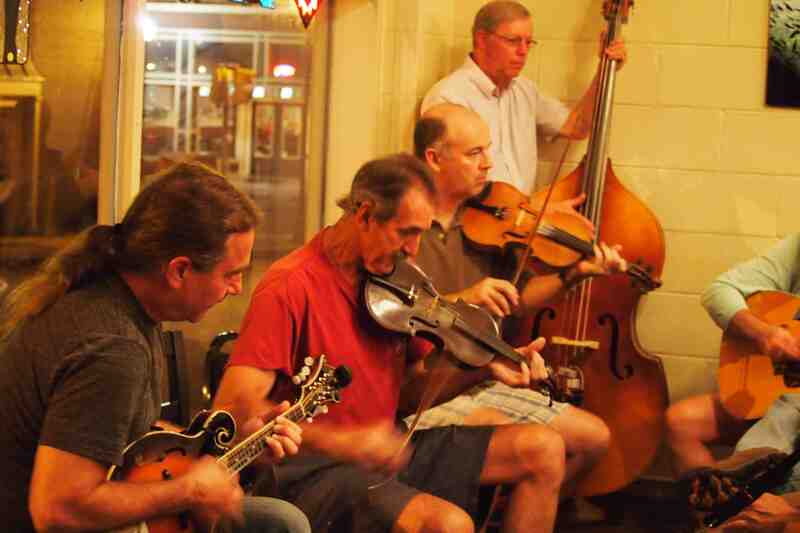 During the first week in August the city of Galax is consumed by its annual Old Fiddler’s Convention, which is the oldest in the country. Beginning in 1935 the local Moose lodge has hosted amateur fiddlers and other traditional instrumentalists. Aside from the competition, jam sessions happen late into the night, and that’s where younger inexperienced players learn from the veterans. 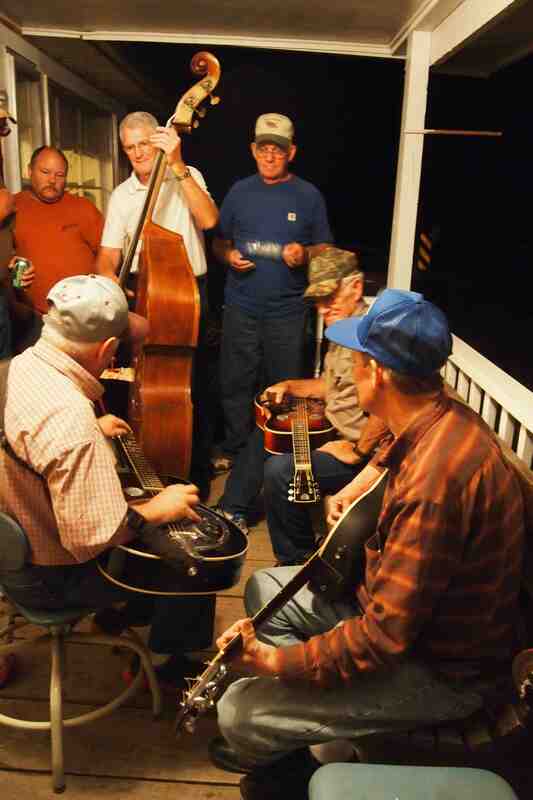 A campsite jam session at the Old Fidder’s Convention in Galax. We were there for the start of this year’s convention. 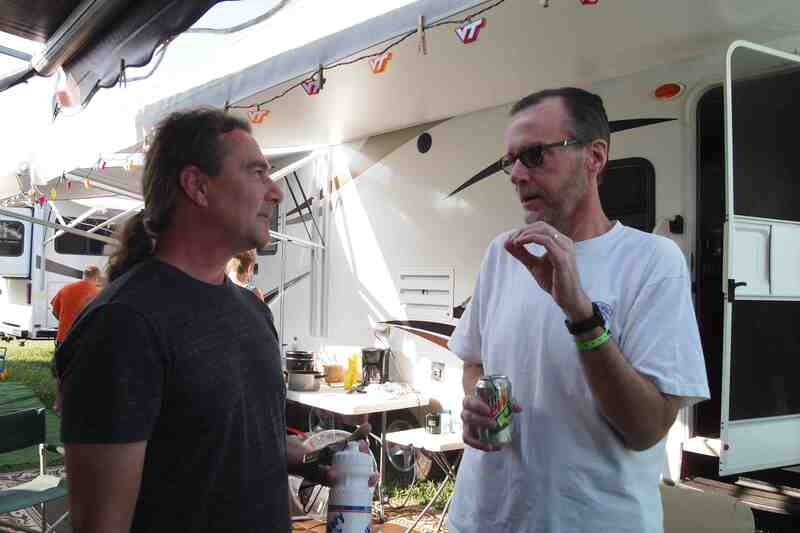 Musician and Crooked Road executive director Jack Hinshelwood was camped out for the duration and he took the time to show us around. Our final event of the evening was a concert at the Blue Ridge Music Center. 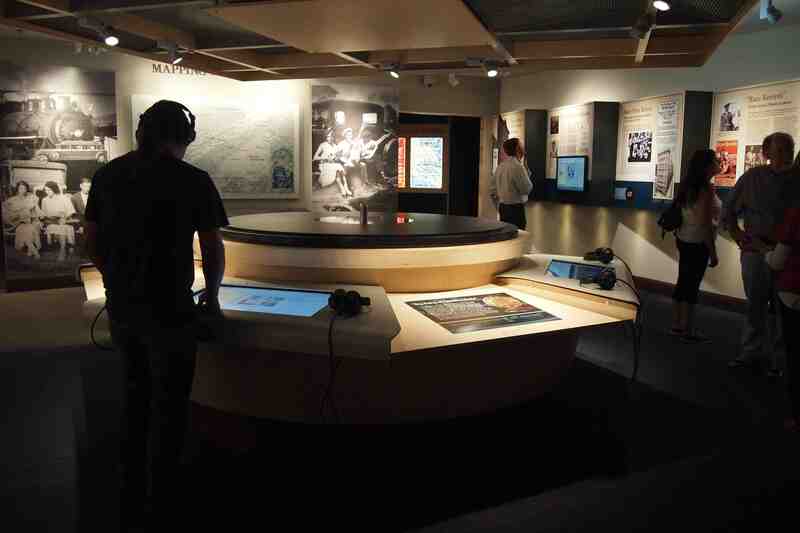 Located along the Blue Ridge Parkway, this amazing place features an interactive, state-of-the-art museum telling the story of the roots of American music. It is also a live outdoor music venue set in a breathtaking backdrop. We saw Junior Sisk & Rambler’s Choice. Sisk is Society for the Preservation of Bluegrass Music Association Contemporary Male Vocalist of the Year. An excellent band, surrounded by the greenery of the Blue Ridge Mountains. I kept asking myself, am I really here? 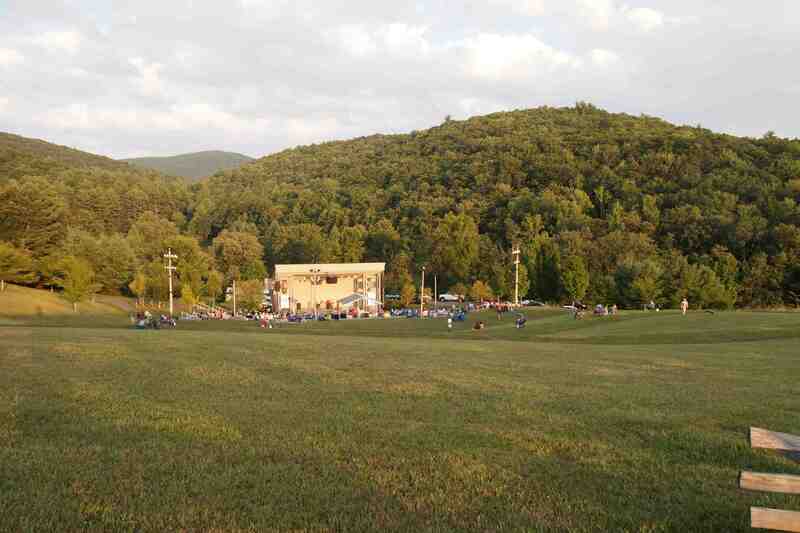 Outdoor stage at the Blue Ridge Music Center. An hour and a half drive brought us back to Floyd and the evenings’ lodging at the bed and breakfast Bella La Vita. We arrived at this peaceful villa late at night. Even in the dark it was a beautiful setting and the starry night drew us outside to star gaze. 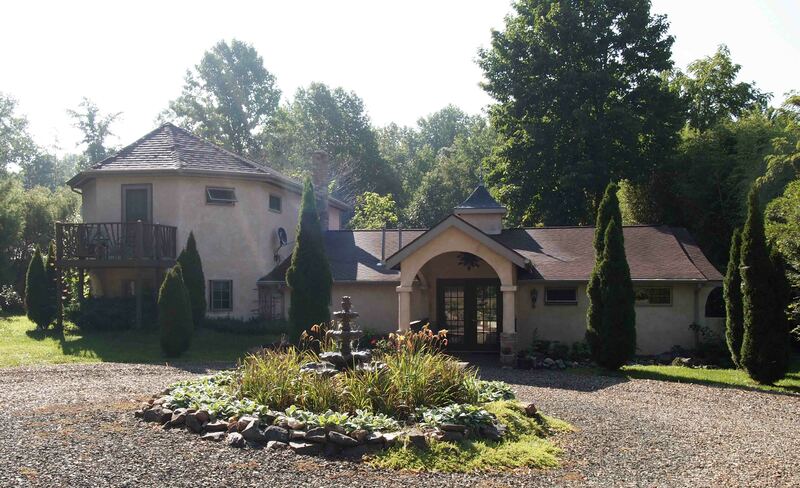 Bella La Vita bed and breakfast, Floyd, Virginia. Our final day on the Crooked Road began perfectly. Bella La Vita owners and hosts Lisal and Matthew Roberts, greeted us with eggs Benedict and warm hospitality. They immediately made us feel comfortable and welcome, giving us lots of information about the area. 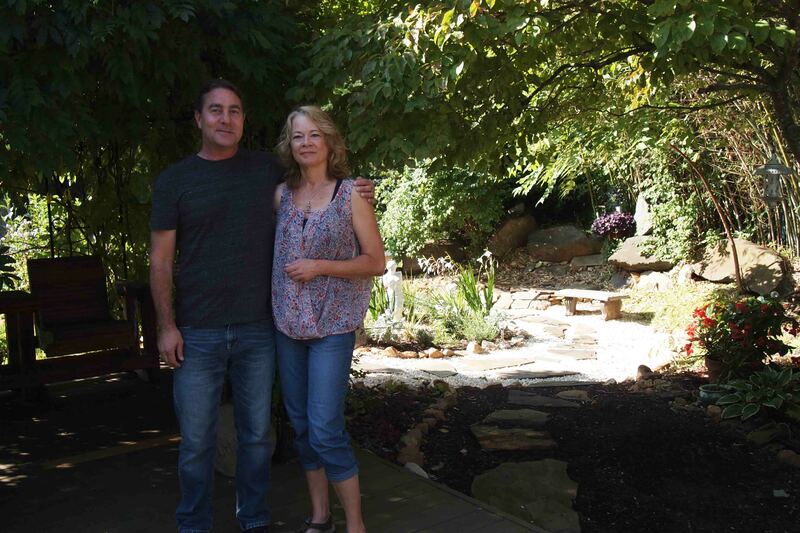 Before leaving, they invited us to visit their garden—a beautiful and peaceful setting. It was VERY difficult to leave. We would have liked to wallow in their hospitality all day! Before leaving Floyd, we stopped by County Sales, which has the world’s largest selection of bluegrass and old-time music. More than 4,500 CDs, cassettes, books, and videos of American traditional music are stacked floor to ceiling, wall to wall. Most of their sales are now done online (www.countysales.com), but they also welcome visitors. 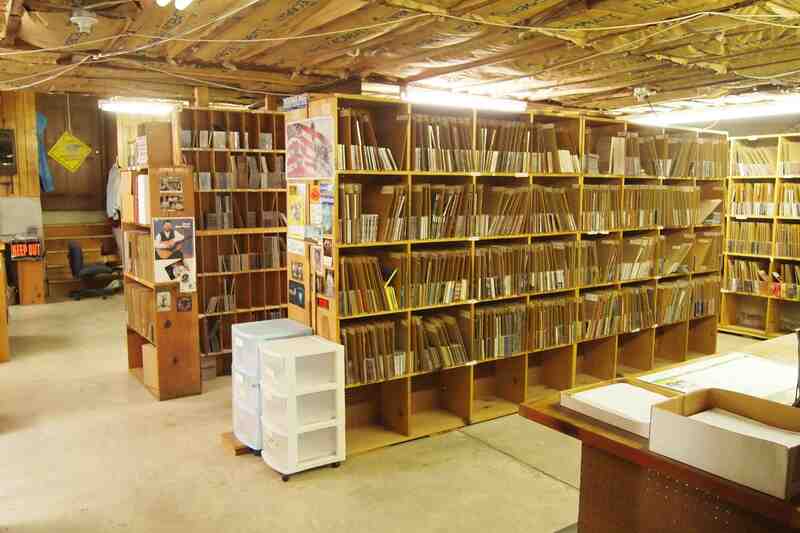 A peek inside County Sales, the world’s largest collection of American traditional music. We took Shooting Creek Road from Floyd to Ferrum. Before we left Bella La Vita, Matthew Roberts explained that Shooting Creek was an old moonshine route. As the law approached, moonshiners would fire shots, one after another along the road, to warn each other. 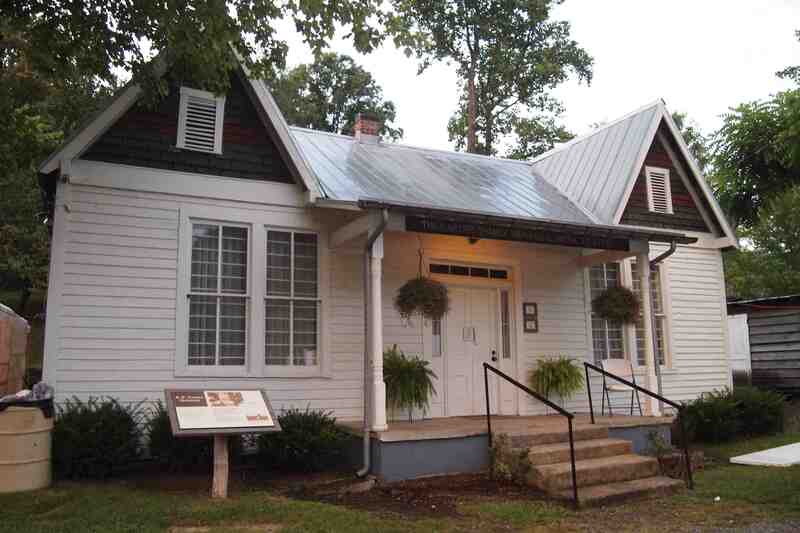 The Blue Ridge Institute museum at Ferrum College. In Ferrum we visited the Blue Ridge Institute located at Ferrum College, which has a small museum dedicated to the folk heritage of the region. Museum Director Roddy Moore and Assistant Director Vaughan Webb talked to us about the music history of the area, including the critical role that African Americans played in the development of the region’s music. 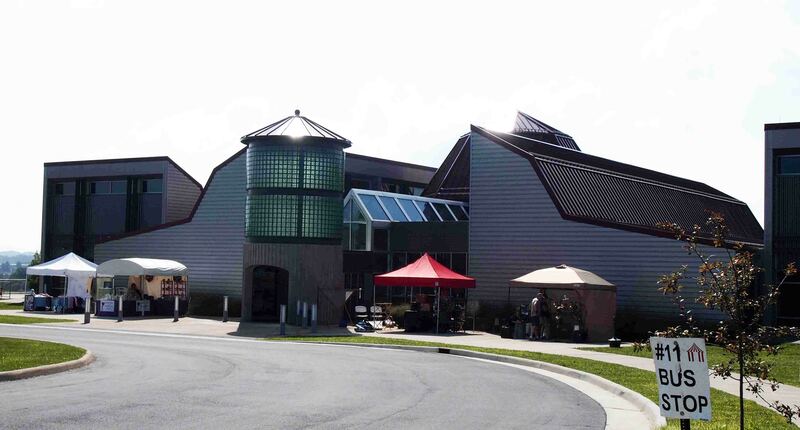 The institute hosts the annual Blue Ridge Folklife Festival on the fourth Saturday of October. It brings together musicians, cooks, craftspeople, mule jumpers, etc., for a one-day celebration of heritage and traditions. 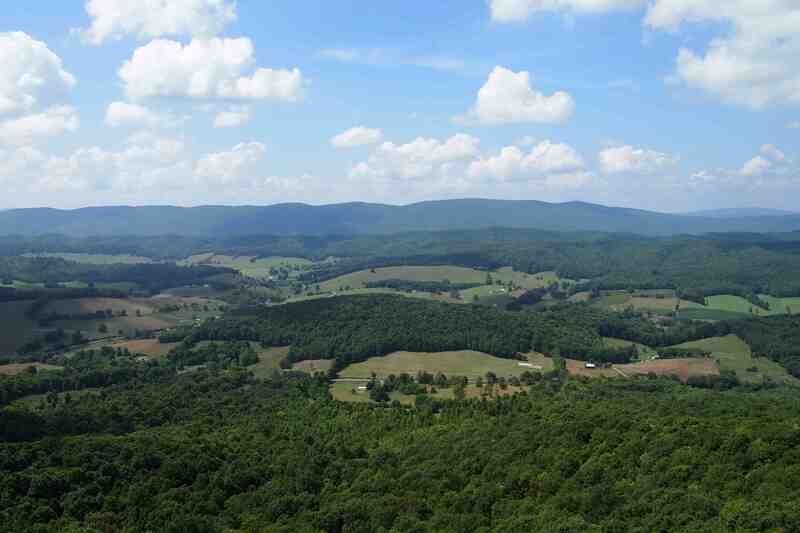 The breathtaking view from the top of Big Walker Lookout. After a two-hour drive we arrived at Big Walker Lookout in Wytheville, Virginia. Opened in 1947, by Stuart and Abigail Kime, this unique store and lookout tower has been a family-owned operation for three generations. 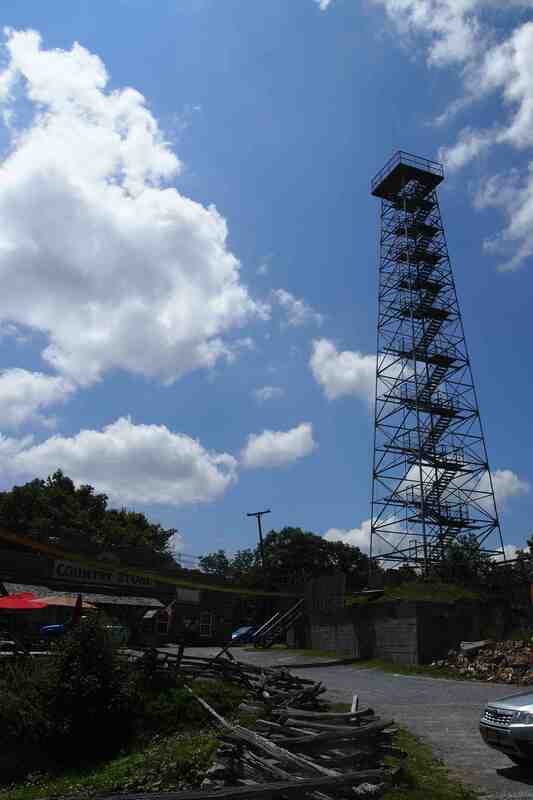 The 100-foot tower, set on a 3,405-foot elevation, gives a bird’s eye view of the beautiful countryside. The country store sells ice cream, other snacks, souvenirs, and local crafts. It frequently hosts live performances from local musicians. Young competitors waiting for their turn to take the stage. Each young competitor can be accompanied by one other instrumentalist. We arrived back at the Galax Old Fidder’s Convention in time to chat with the judges and musicians just as the official competition was beginning. The first day’s competition is always dedicated to youth competitors. David White, who is also a mandolin player, talks with Mandolin Player of the Year Adam Steffey. 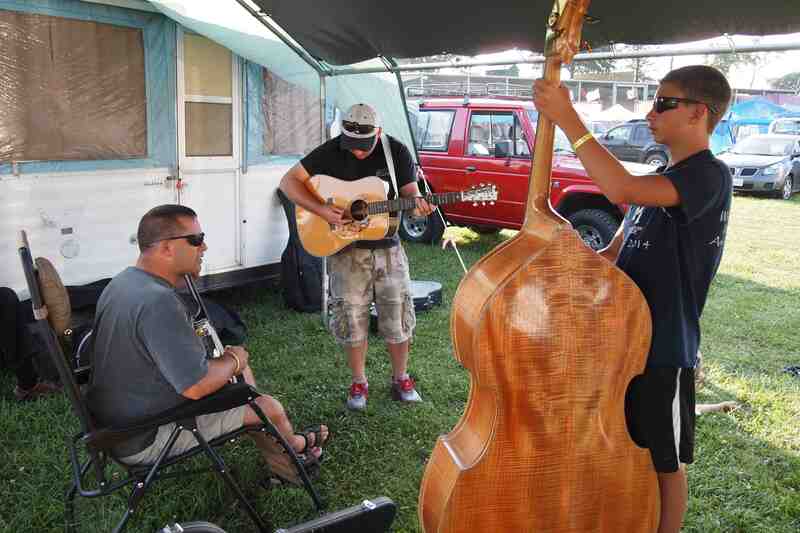 We wandered the campgrounds with Jack Hinshelwood, listening in on informal jam sessions and chatting with musicians. We were fortunate to meet 10-time IBMA Mandolin Player of the Year Adam Steffey who chatted with us about the fiddle convention and the local music scene. Steffey is a five-time Grammy winner and is nominated again for 2014. That was one of the most amazing parts of this trip. 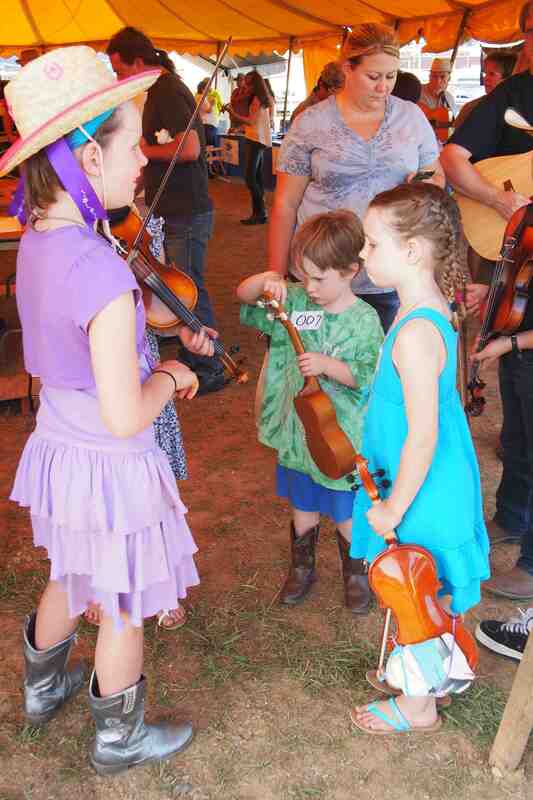 Every single musician we met took the time to chat with us and help us learn about the music, such as the subtle differences between old-time and bluegrass. They were all very passionate about their music and helped us to gain a deeper appreciation for their unique culture. And if you play, you are welcome to join in. Our final Crooked Road destination was the Monday night jam at River City Grill in Radford, Virginia, led by Ralph Berrier (second from right). Our final stop was the River City Grille in Radford, Virginia, where a scaled-down Monday night jam led by Ralph Berrier was going on. This friendly group was a great final send-off in our immersion in traditional music on the Crooked Road. You can read more about The Crooked Road in November, in the November/December 2014 issue of Making Music magazine (www.makingmusicmag.com).